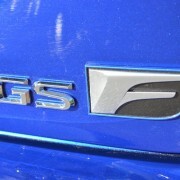 For the knowledgeable, the signs are everywhere apparent that the GS F is a factory hot rod. The first thing car enthusiasts check out is not the size of the 12.3″ display on the dash screen. 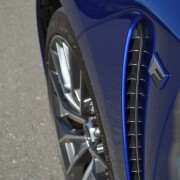 Rather, they’re much more interested in the contact patch the tires purchase on the road surface. 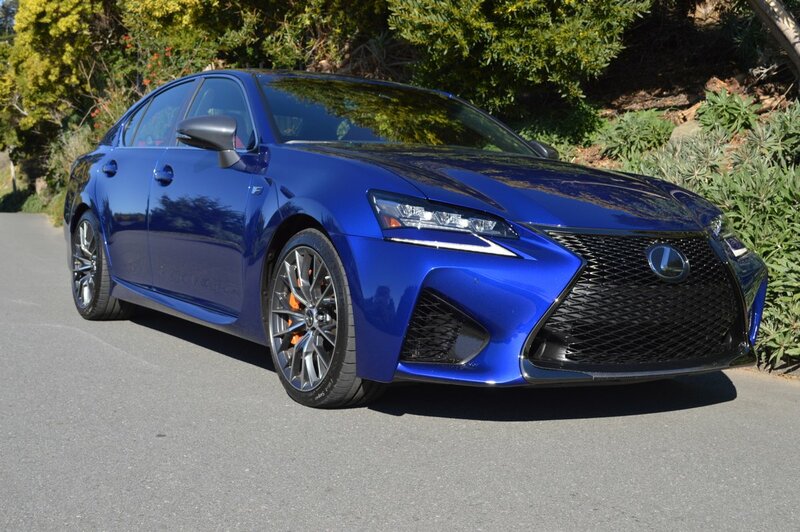 In this department, the GS F is in a league of its own, with ultra-sticky (TW 300, Traction AA) Michelin Pilot Super Sports at all corners – 255/35ZR19 up front, 275/35ZR19 out back. 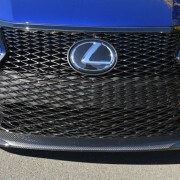 Nor has Lexus stinted on wheel size. 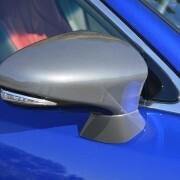 Most manufacturers are loathe to disclose rim width in the literature they provide on the window sticker or in the glovebox. 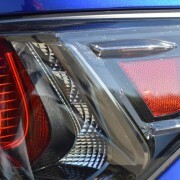 Not Lexus. 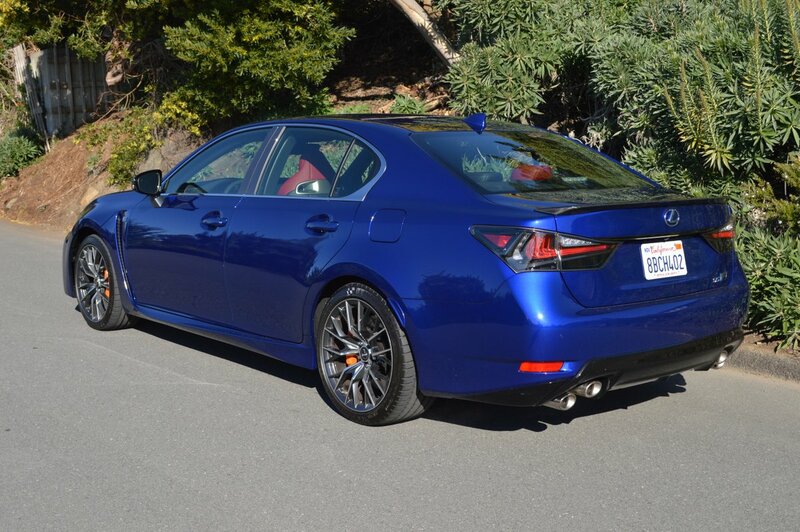 The F model carries whopping 9Jx19″ forged alloy wheels up front and even wider 10Jx19″ rear rims. And be sure to take note of the Michelins’ ZR speed rating designation. which means these tires are good for sustained speeds of more than 137mph. 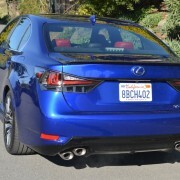 Without question, the GS F is quick enough to justify its stellar rubber. Though the F’s wingless external appearance looks rather subdued, there’s no mistaking the car’s performance mandate when you depress the starter button and fire off its 5.0 liter V8. This earth mover immediately settles into an intoxicatingly lumpy idle. 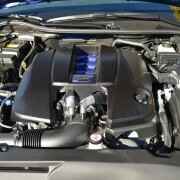 Like wine mavens sniffing the nose of a cabernet, driving enthusiasts discerningly assess the exhaust note of a highly tuned V8. 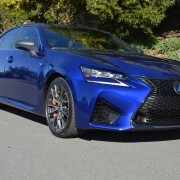 This Lexus, with double overhead cams, 32 valves, direct and port injection, and variable exhaust and intake valve timing, instantly passes muster. Its throaty burble at idle transitions to a relentless yowl at redline. Few cars can match the F in the quarter mile sprint. 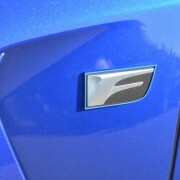 If you flatten the aluminum treaded “F” Sport gas pedal, you better be prepared for instant and unrelenting acceleration. 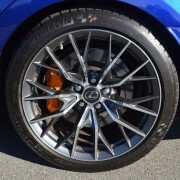 Braking is equally well handled, with monster orange 6-piston calipers up front aided by two piston rears. 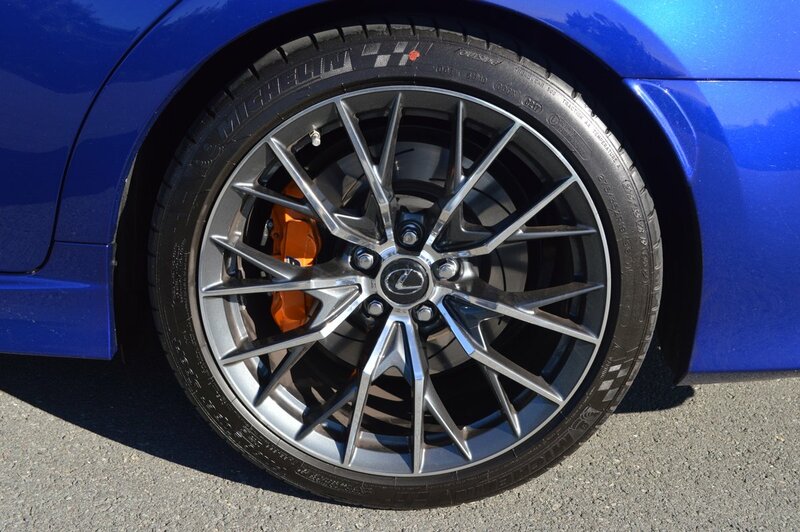 Lexus supplies special high friction pucks for these ventilated beauties. 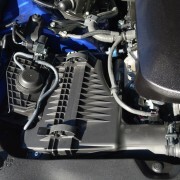 Cooperating ideally with the engine’s rocket launch mission statement is an 8-speed “Sport Direct-Shift Transmission” with steering-wheel mounted “F” Spec paddle shifters. 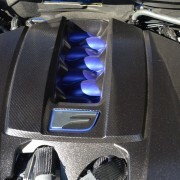 Because the paddles are alloy, they feel refreshingly cool to the touch. They’re also large enough to locate without sending out a search party in a turn. The F’s sophisticated suspension depends on double wishbones up front and multi-link geometry in back, with Sachs shocks to oversee ride quality. 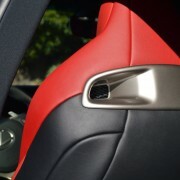 Lexus offers a Driving Mode selector switch on the console which tailors the behavior of the F to your needs. Four positions are available: Eco, Normal, Sport and Sport+ with a fifth provision for customization. You need to play with this unit for a bit before its attributes become clear. The sluggish Eco setting is perfect for maximizing gas saving (24MPG) on the freeway, but not at all what you’d want on a back road. Normal works well as a compromise between zip and comfort. 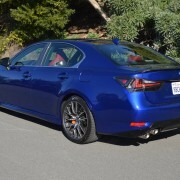 Sport and Sport+ were my personal favorites, as they stiffen the F’s ride and responsiveness. 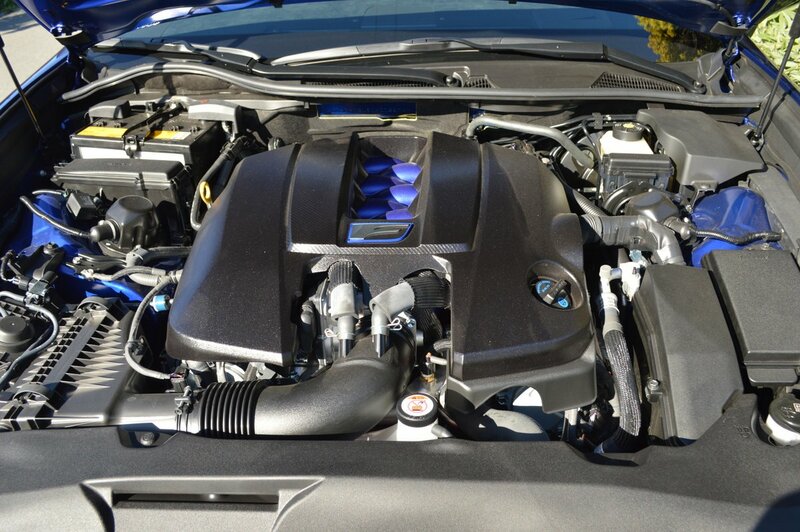 The price you pay is higher fuel consumption and increased engine noise from higher rpm operation of the V8. The luminescent tachometer face, which is twice the size of the speedometer, changes design and color as you change your Drive Mode selection. 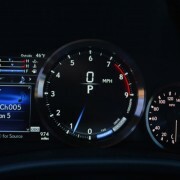 The tach lacks a conventional pointer, instead using illuminated segments to mark its progress to redline. 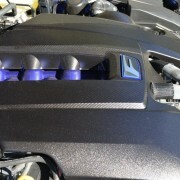 The redline increases as the engine reaches full operating temperature. 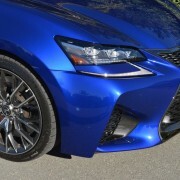 Although outward appearance can pass for conservative, the GS F sports enough carbon fiber to pass for a race car. 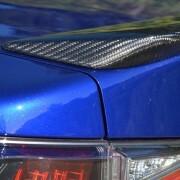 On the outside, the front splitter and rear spoiler are clear coated carbon pieces. 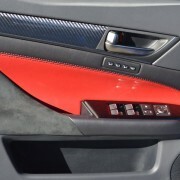 Inside the lush cabin, carbon decorates the center console, dash face and door panels. 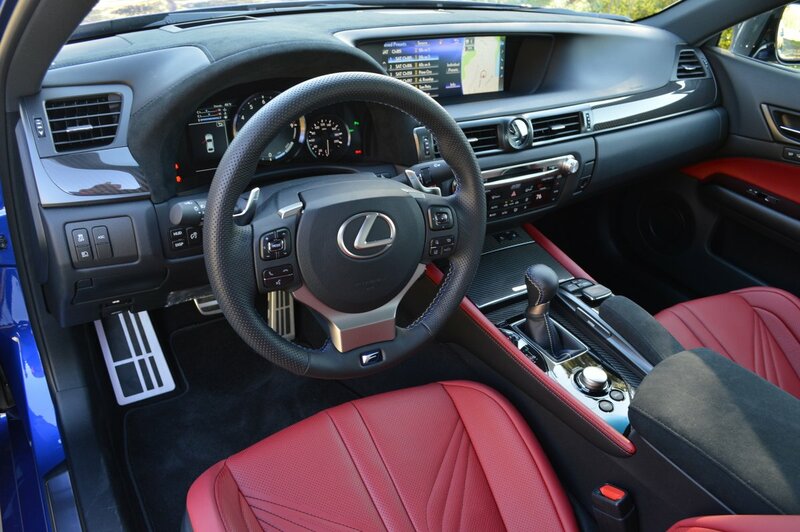 Lexus has taken pains to equip the dash top surface, center arm rest and door panels with suede-like black Alcantara stitched with blue thread to match our test car’s stunning Ultrasonic Blue Mica exterior. 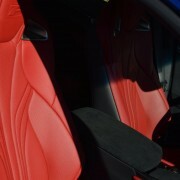 Even better than the subtle thread counterpoint is the choice of smooth leather for the “F” Spec Sport Seats, which look like they had been pilfered from one of the Lexus team cars that recently raced at the Rolex 24 at Daytona. These seats are immensely supportive and comfortable, with stylized fountain-like ribbing and embossed “F” signatures on the headrests. 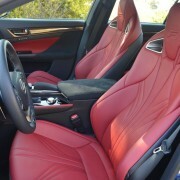 The back seats are remarkably comfortable as well. So what’s the downside to the F? Mileage is the bugaboo if you exercise a heavy throttle foot. The gas tank holds only 17.5 gallons, and since we averaged about 17MPG (EPA says 19MPG overall), that yields a modest range of under 300 miles. So plan on making lots of trips to the pump island with this beast. 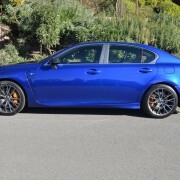 But every $55 fill-up will be worth that cost and then some for the sheer driving pleasure you will derive from this phenomenal GS-F.